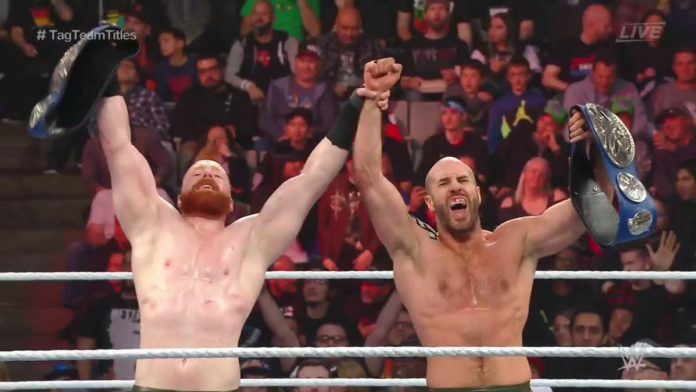 The Bar retained the SmackDown Tag Team Titles Titles at Sunday’s (December 16th, 2018) WWE TLC pay-per-view event in San Jose, California at the SAP Center on the WWE Network. They beat The Usos and New Day in a Three Way Match at the show. The Bar won the titles by defeating The New Day on October 16, 2018 in Washington, D.C. on the SmackDown 1000 episode. This marked their first reigns as champions as there have been 11 reigns between 7 teams, and 15 individual champions. It will be interesting to see if the Usos or New Day get another crack the gold as it could come as soon as Tuesday’s episode of SmackDown Live in Fresno, CA at the Save Mart Center or the following week which will be taped this coming Tuesday. It’s possible that WWE waits until the next time they are on pay-per-view as the Royal Rumble pay-per-view event goes down on Sunday, January 27, 2019 in Phoenix, Arizona at Chase Field. Time will tell how WWE handles the booking for the next feud involving The Bar. What are your thoughts on winning the title and this title change? Was it the right time to do this by WWE? Sound off in the comment section.